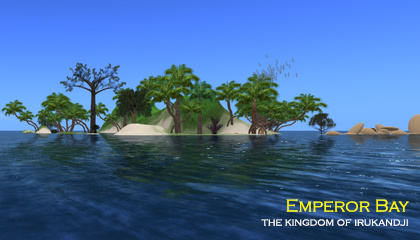 Emperor Bay on the InWorldz grid was a water sim in northeast Irukandji. Arriving late in the InWorldz version of Irukandji, Emperor Bay served as a linking sea that joined the new Reef City sim to the old estate. It also provided a conduit to the western corridor of the kingdom and the new underwater fantasy state Eromanga. On the northern edge of Emperor Bay, a long prim beach served as the local playground beach for Reef City. A long airstrip also ran north to south on the far eastern edge of the sea. 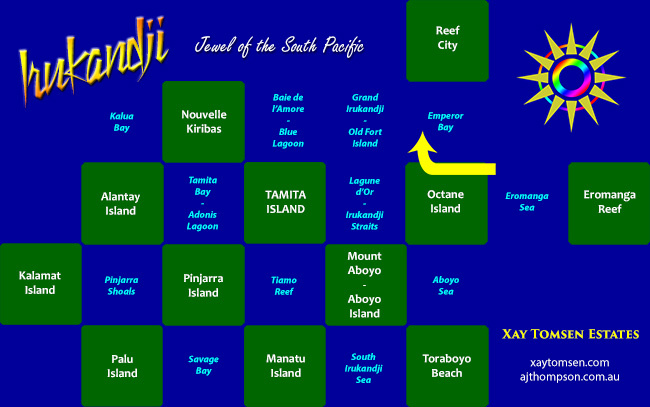 Regions that adjoined Emperor Bay were Reef City, Eromanga Sea, Octane Island, Irukandji Straits, and Old Fort Island. One photograph survives of Emperor Bay. The sim does not fit into the traditional Irukandji story, and will most likely not be included in future versions of the kingdom.